After the DUPLO® invasion, Bricksburg has become a shell of its former self. Many of the residents of this once vibrant city now live in the wastelands dubbed Apocalypseburg. The center of which is a ramshackled citadel. Welcome To Apocalypseburg! 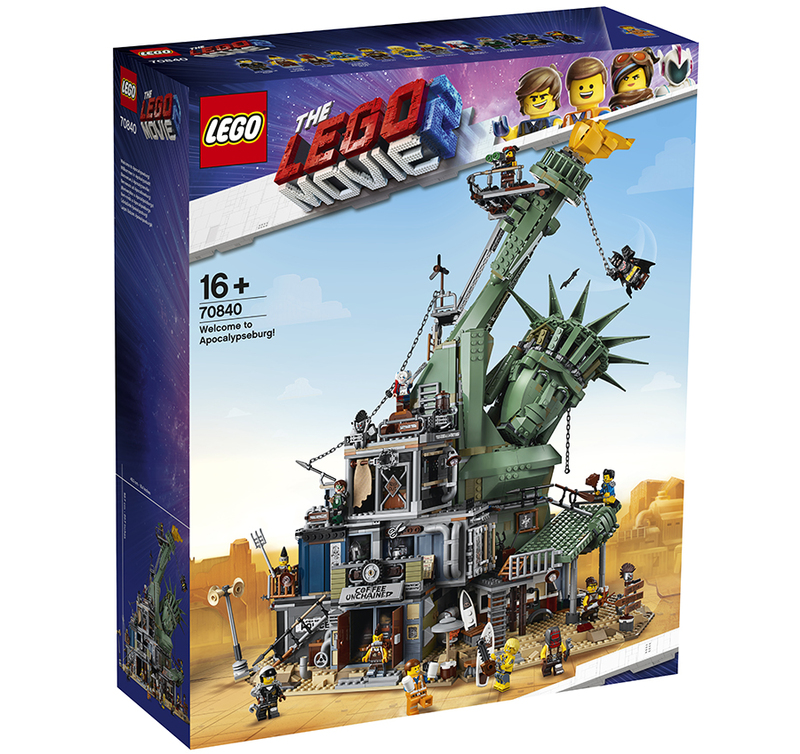 is the first direct to customer set based on The LEGO® Movie 2 and what an epic set it is. 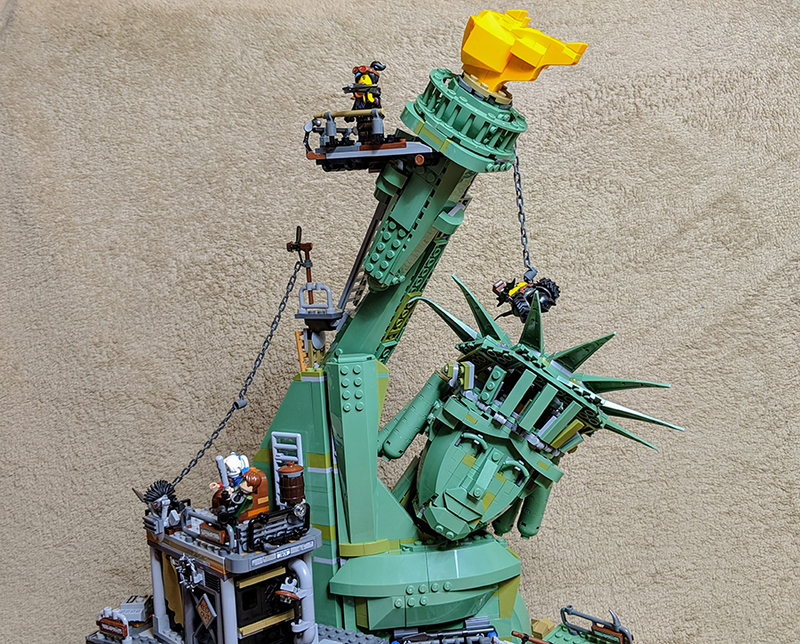 Inspired by the classic apocalyptic image of a fallen Statue of Liberty, the 3000 plus piece set is packed with details, fun Easter Eggs and Minifigures. 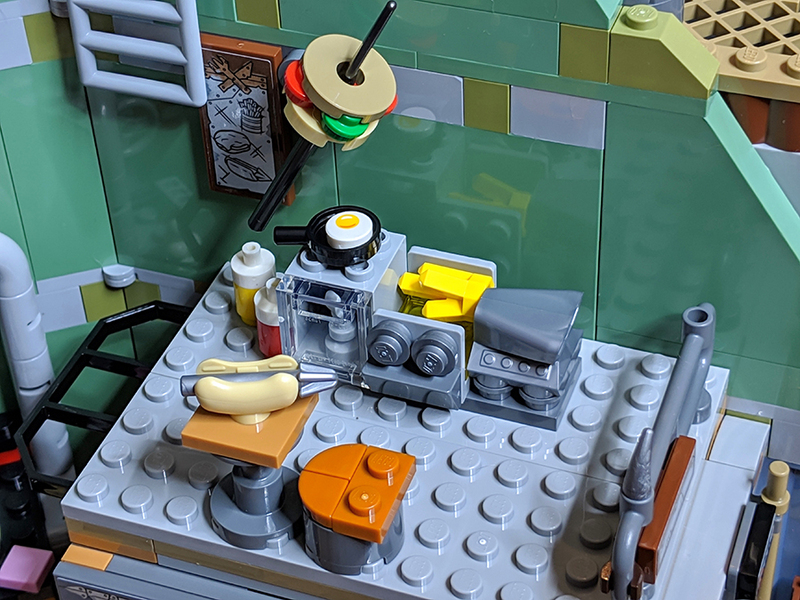 I’ve had the privilege of being about to build the set so let’s take a closer look. Set Name: Welcome To Apocalypseburg! 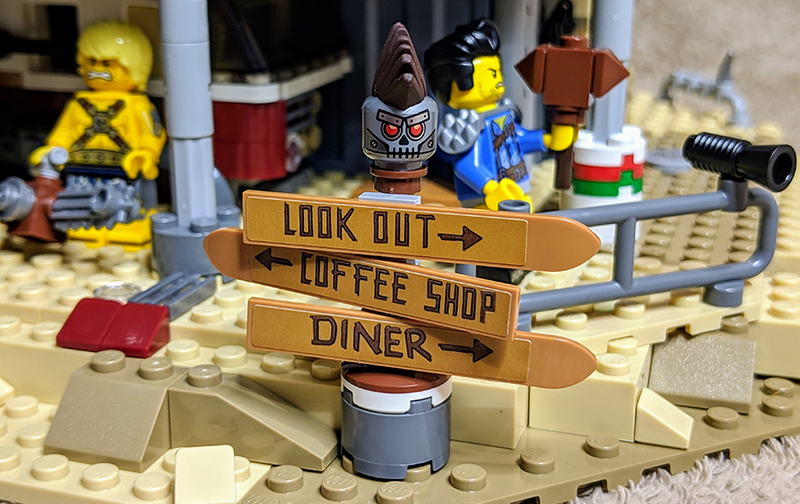 The idea of the set is that after events of Taco Tuesday and the onslaught of the DUPLO Invaders, the once vibrant and perfectly planned city of Bricksburg has become a ragtag dusty wasteland. Where the residents have congregated around a fallen statue and a mismatch of shipping containers, subway carriages, parts of vehicles and any other pieces they can lay the hands on. 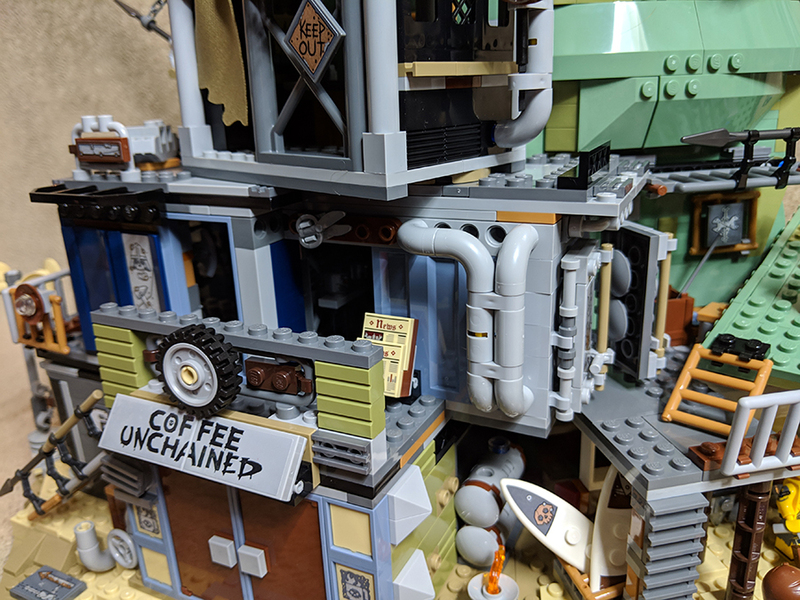 This has resulted in Apocalypseburg, a heckish place, that maybe a little smaller than it appears in the movie, but it still packs in a fair amount of details. The set is built in three distinct sections – two separate bases and then the main section of the citadel on top. As I got to the end of the first base section, I thought this is going to be one of the really unsteady sets. But as I completed the other side of the base section and clipped them together they form an increasingly sturdy construct. The amount of sets I’ve built which require clipping sections together to create a larger surface, which then ”crumble’ merely by looking at it, is fairly high. As this is a 360° playset I’m glad it can be moved around quite easily. 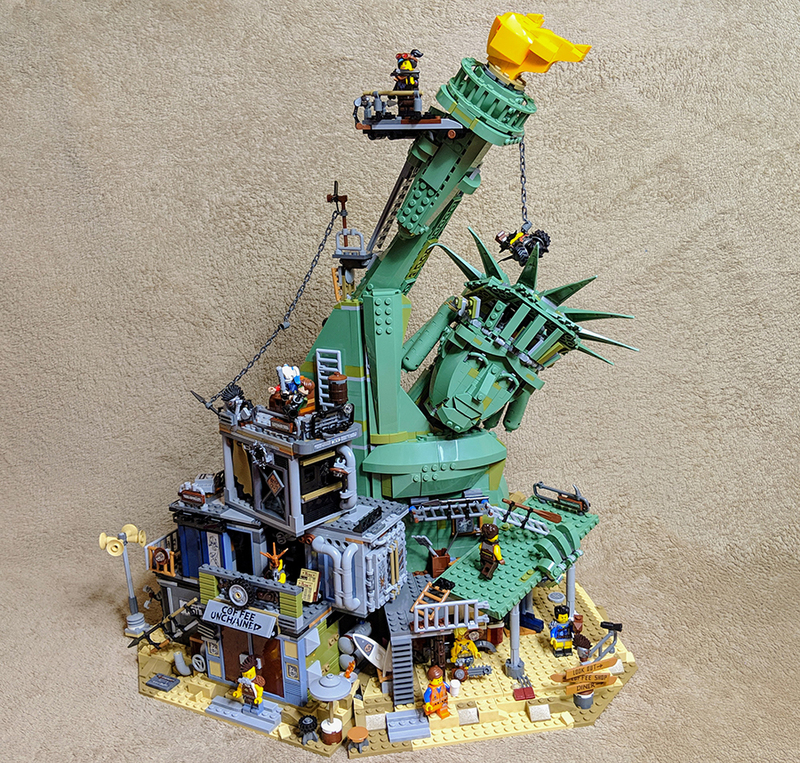 As you build the base sections, you also lay the foundations for the centrepiece of the set – the fallen Statue of Liberty. This was something I thought would be a frailly connected part of the set, but more on that later. 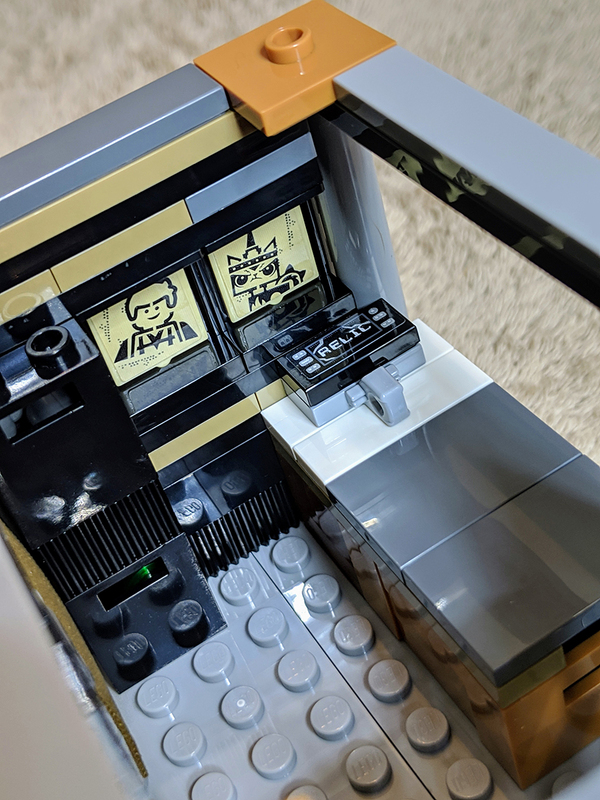 One of the many great things about the set is the seamless flow between being an amazing display piece but also a set that can be played with. Each of the areas of the build can be accessed by removing floors or entire sections. Yet simply looking at the set wouldn’t reveal this can happen. As mentioned above, the set is made up of various things which have been mangled together by the Master Builders. This results in an amazing array of Easter Eggs and exceptional use of parts. 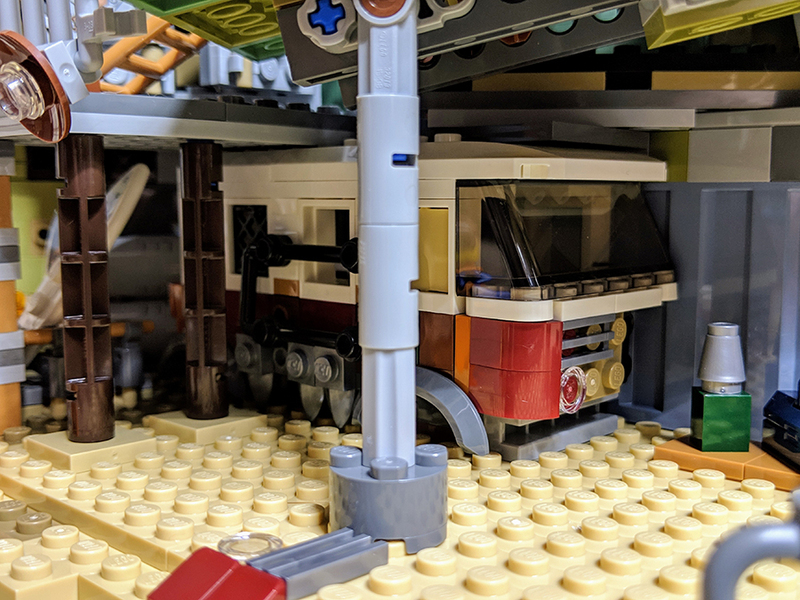 I started to build one of the sections only to realise it was a mini VW style camper van, another was a old American muscle car, now being used as a jacuzzi bath, a tube carriage becomes a makeshift gym. 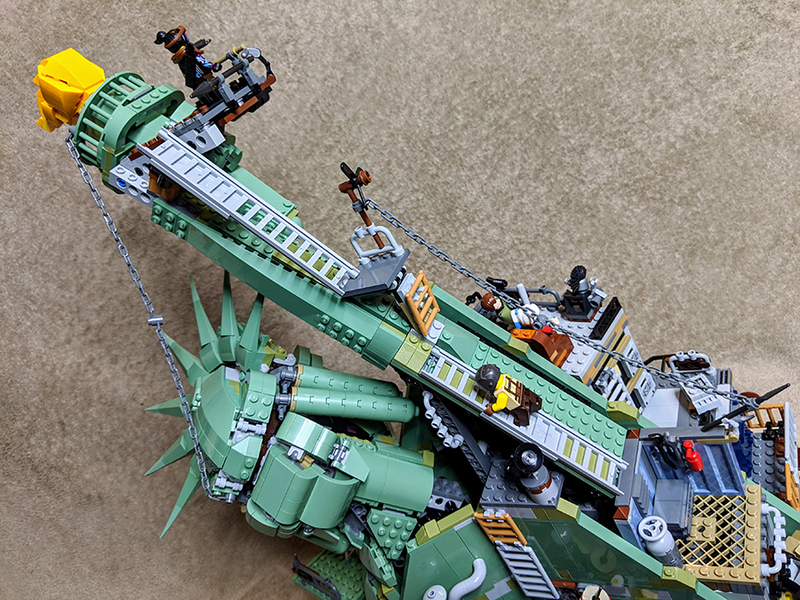 I think this is why I enjoyed building the set so much. As you built a seemingly random section, it slowly becomes apparent what you’ve actually built. 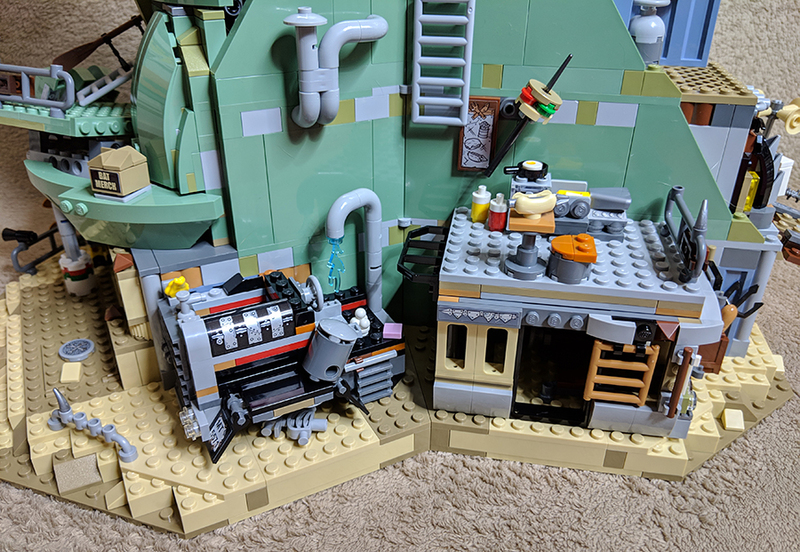 Another great thing about a set this size is the ability to pack in a decent selection of Easter Eggs, many of this are achieved with sticker detailing and help give the set an extra level of character. 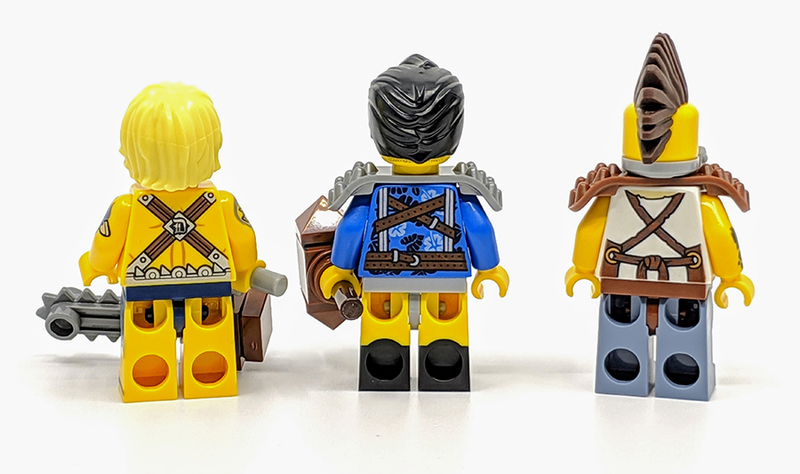 Beyond the traditional inclusion of the designer’s initials, there are nods to the first movie, NINJAGO, the Leicester Square store and even The LEGO Batman Movie. I won’t list then all as part of the fun to searching them out, but some of my favourites are a Planet of the Apes inspired poster featuring the Where are my Pants? guy. 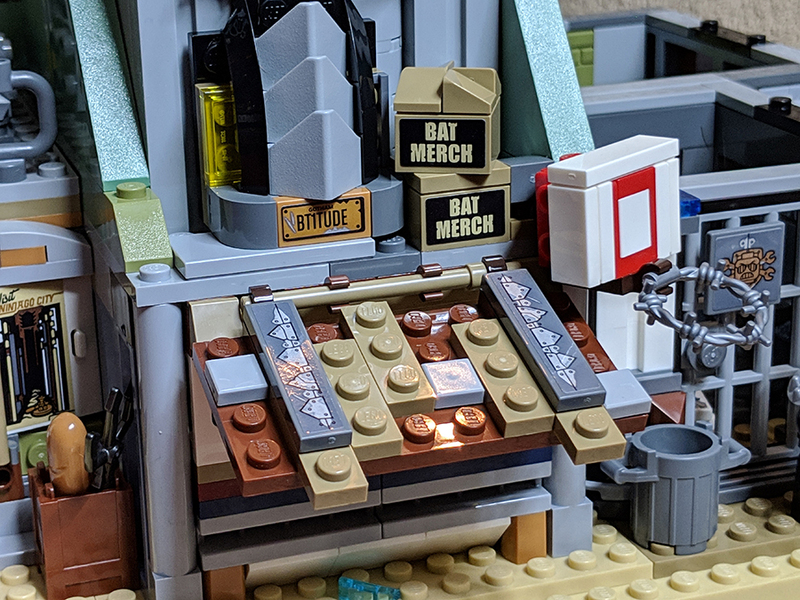 The grill of Batmobile from The LEGO Batman Movie and a great little punchbag, made to look like a tiny DUPLO alien. 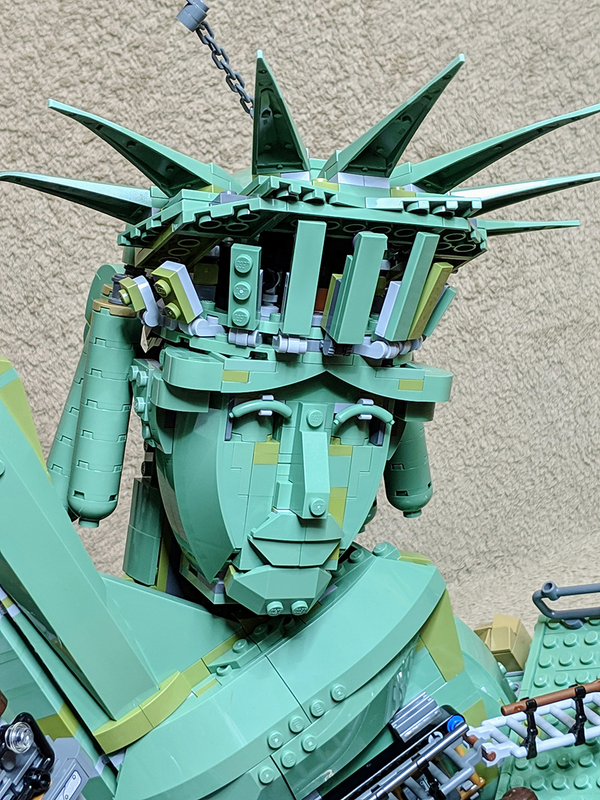 The centrepiece of the set is a LEGO recreation of the Statue of Liberty. This iconic structure has been used in numerous films to help depict a desolate apocalyptic future. 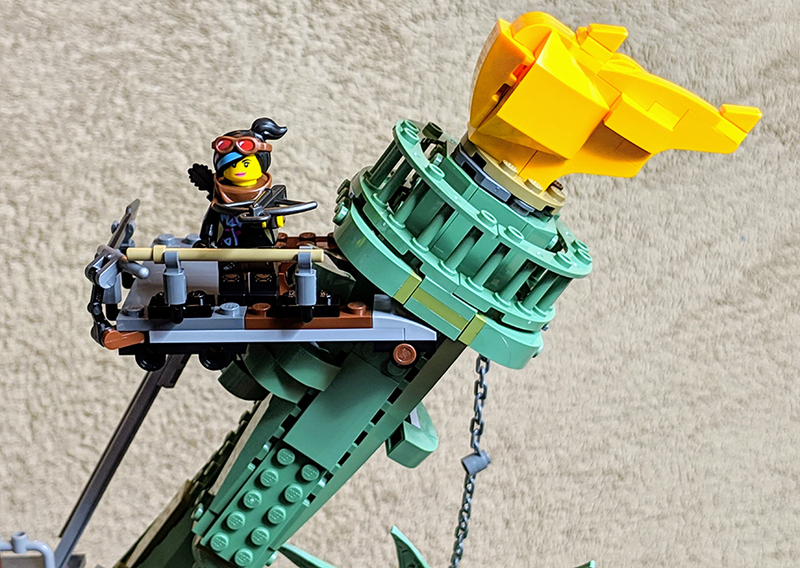 Famously used in Planet of the Apes and Escape From New York, the trope has been commandeered for The LEGO Movie 2 with great effect. Not only does it lend itself perfectly to providing a stunning visual treat, the build is amazing. 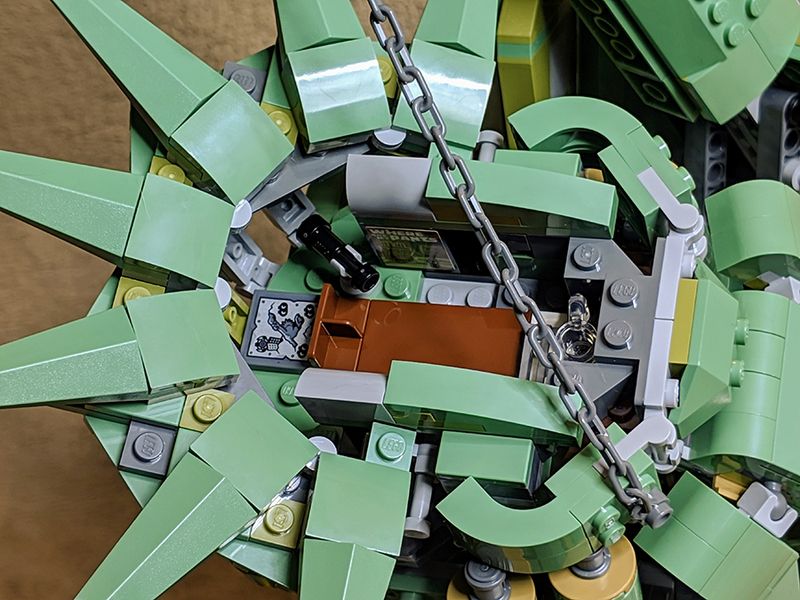 I was expecting it to be a tricky mass of parts connected together in such a way, that simply moving it may result it something falling off. 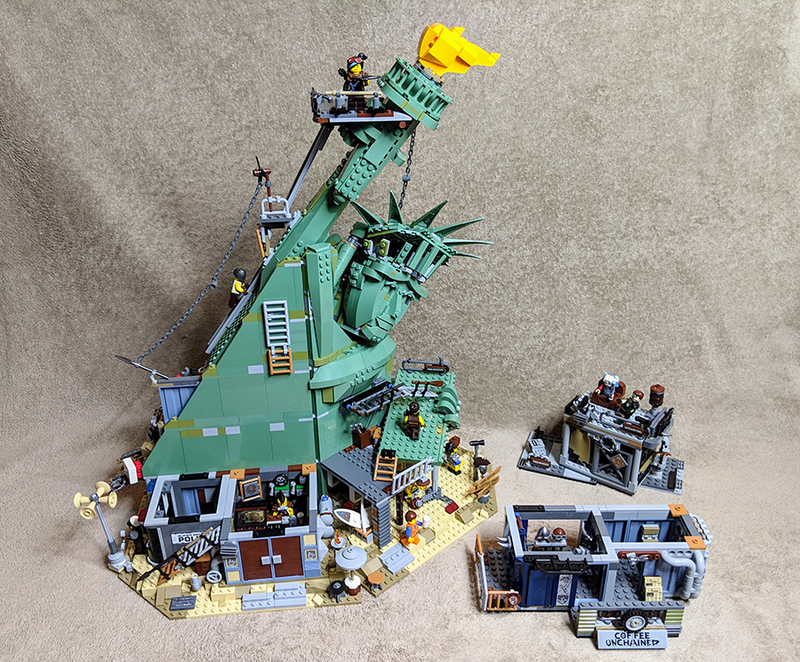 It’s the complete opposite, each section is expertly designed to be sturdy and well connected to the rest of the build. Not one bit feels oddly placed or poorly integrated. All of the structural stuff is well hidden within the inners of the statue, it’s an engineering marvel. I always like to balance reviews by honestly pointing out flaws or things I didn’t like and I genuinely can’t say there is anything bad about the set. 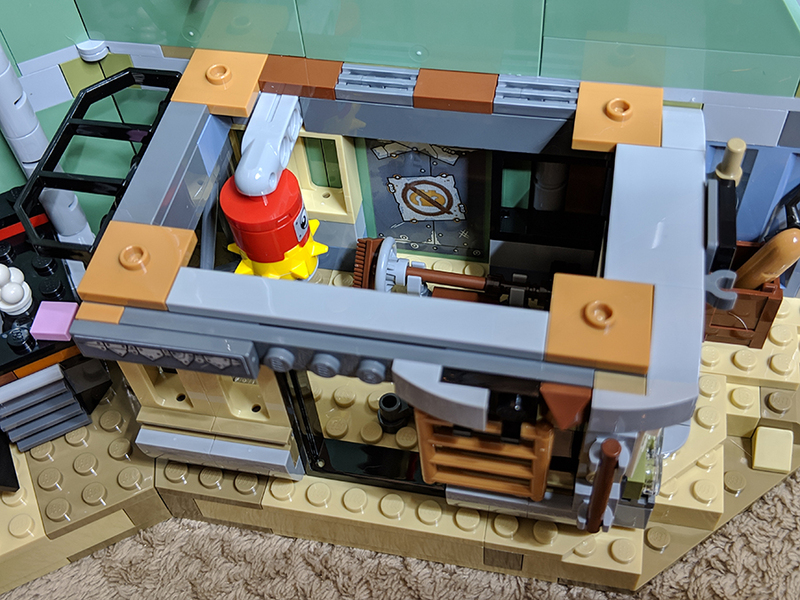 I really enjoyed the build, just as much as the resulting set, even the masses of stickers didn’t annoy me as they add so much more detail. I guess it’s an expensive set, the price may be an issue for some and rightly so as it pushing nearly £300. 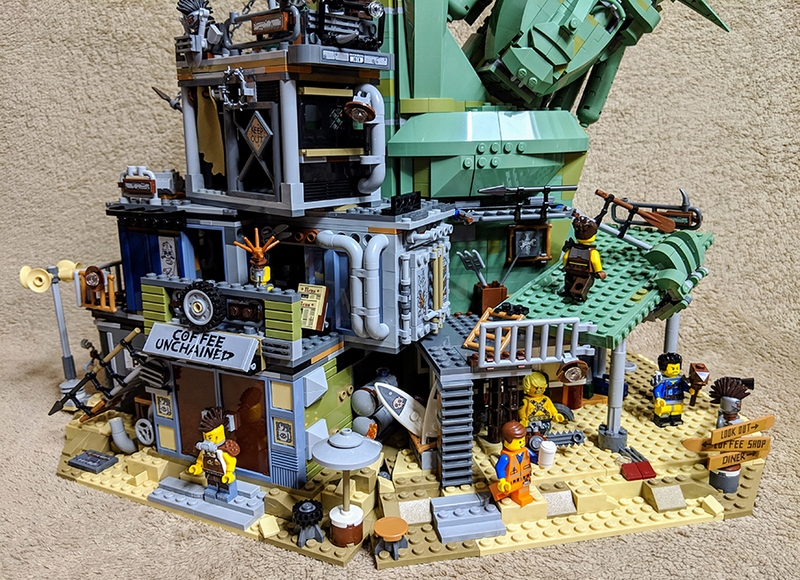 Then if you compare it to NINJAGO City, which included more pieces and minifigures at a slight lower price, it may seem Welcome To Apocalypseburg! is venturing into the rip-off zone, but the sets does include some rare and new elements, as well as a large selection of recoloured pieces. There is one thing I was hoping it would feature, the Sewer Babies, it just feels like the ideal set for those drain-dwelling scamps to inhabit. 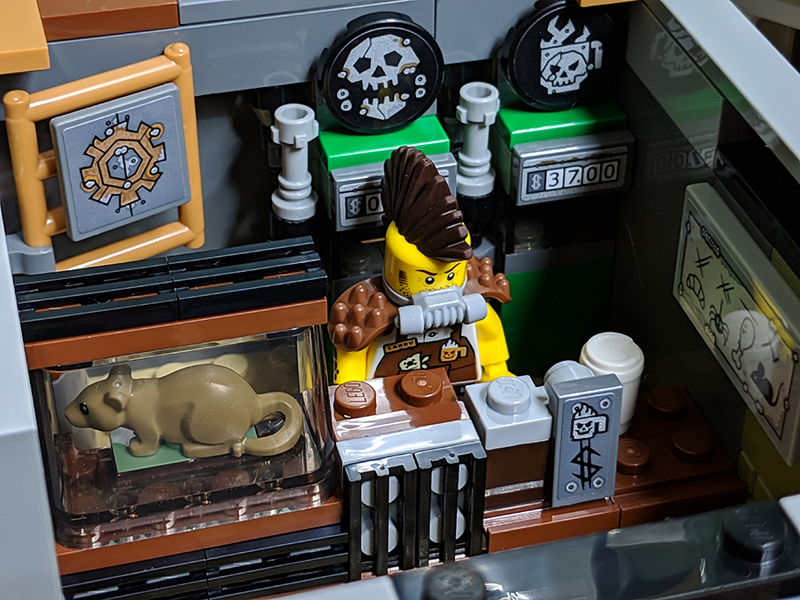 Often the Minifigures are the main attraction in many sets, but they play second fiddle to the build in Welcome To Apocalypseburg! That’s not to say that the selection included isn’t good. You get 12 characters ranging from main cast members to some returning secondary folk and a couple of new faces. There’s even a few faces from the DC Universe. 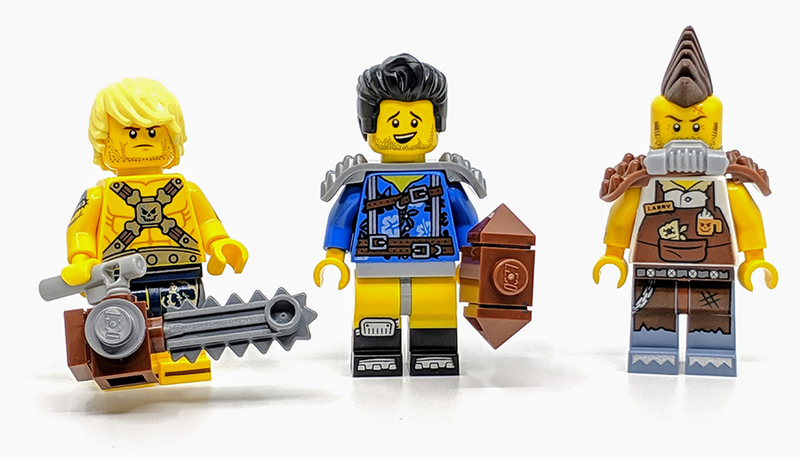 First up are three returning main characters from The LEGO Movie – Emmet, Lucy and Bad Cop. Emmet is his same old self, with the battle of Bricksburg taking its toll on everyone else, Emmet is still the upwardly looking, happy-go-lucky guy he was in the first movie. 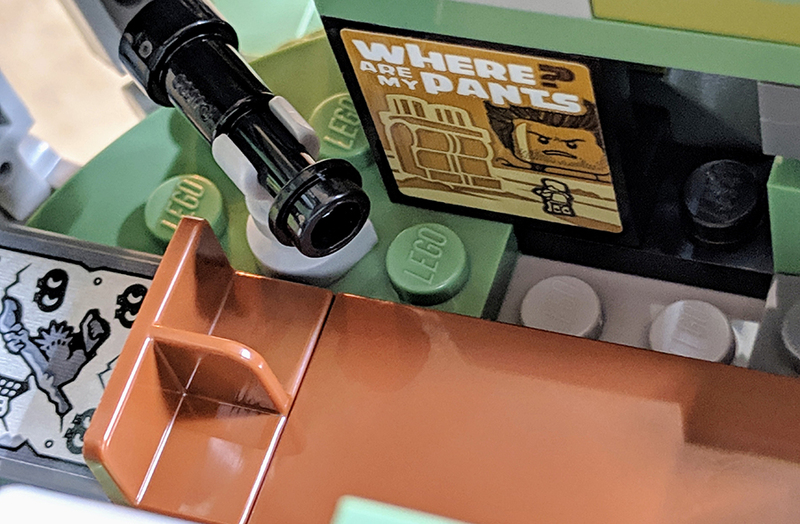 This is reflected in Emmet’s unchanged appearance, although this is part of the joke about Emmet’s character, it would of been nice if the version included here was a little more unique. 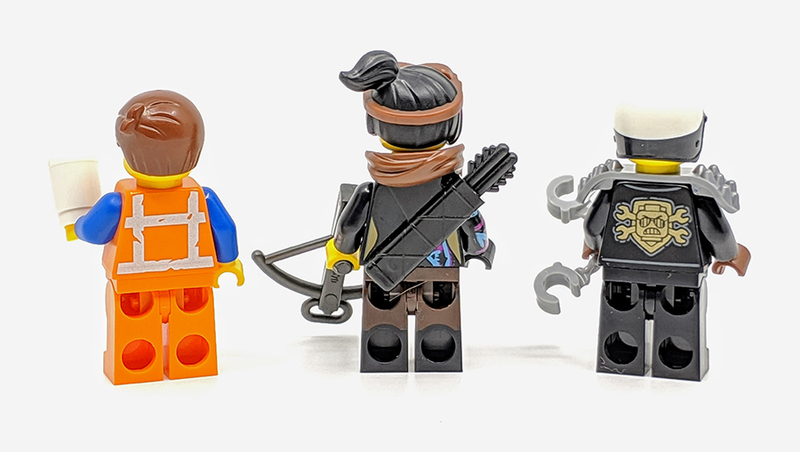 Joining Emmet is Lucy, the Master Builder formerly known as Wyldstyle. Lucy has a new a couple of new elements, her hairpiece now features goggles and she has a new neck scarf piece, with has been moulded in such a way so as to allow for a quiver element to be used as the same time. Bad Cop was once under the thumb of the Octan Corporation, before an unfortunate run in with the scepter of Q-tip and the Polish of Na-il. Now known as Scribble Cop, he’s not that much different from his former self. A little more rhinestone clad and now sporting shoulder armour. He still has his Bad Cop face along with a angry looking scribble face. The endless battle has also affected some of the much loved secondary characters, these include Chainsaw Dave, Where Are My Pants? Guy and Larry the Barista. Former gnarly dude Surfer Dave can no longer shred the waves and now shred DUPLO aliens with his new love of power tools. Dave is an angrier looking version of his former self, still sporting his surfer shorts, he now also wears a scary looking skull and crossbone bandolier. TV star and trouser seeking Where Are My Pants? Guy is still searching for something to cover his legs. I like how his once white ‘underpants’ are now a shade of grey. It might be the apocalypse but folk still need coffee, with The Coffee Chain becoming Coffee Unchained and still being run by Larry. Now a mohawked-battle hardened veteran, Larry has definitely been in the wars and now wears a breather piece. 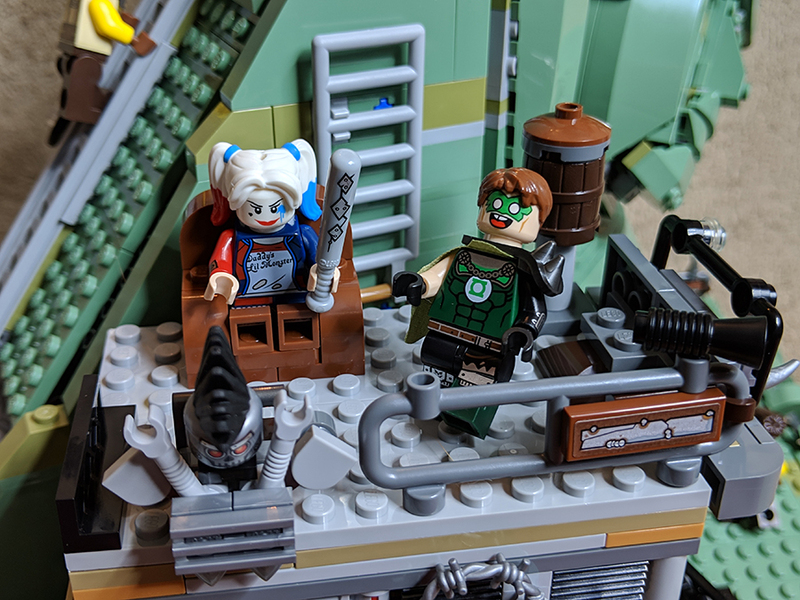 DC Comics characters Batman and Green Lantern both appeared in the first movie and this time around they are joined by fan favourite Harley Quinn. 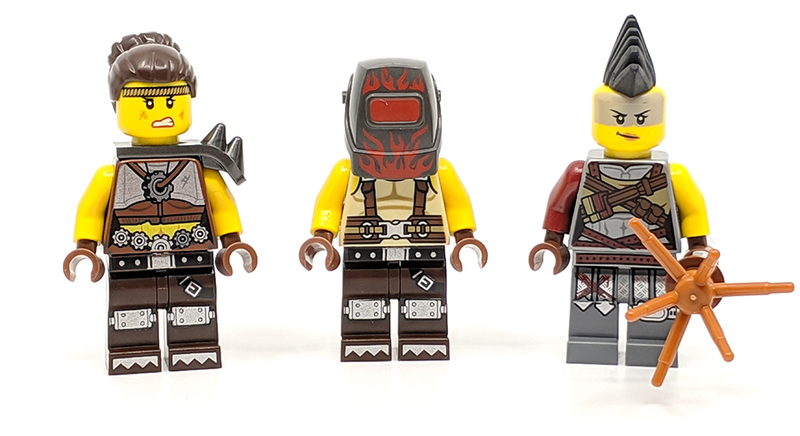 Now Suicide Squad, isn’t exactly in keeping with the LEGO family values, but as Margot Robbie voices her in the movie, it was the perfect opportunity for LEGO to give fans that version of the character. 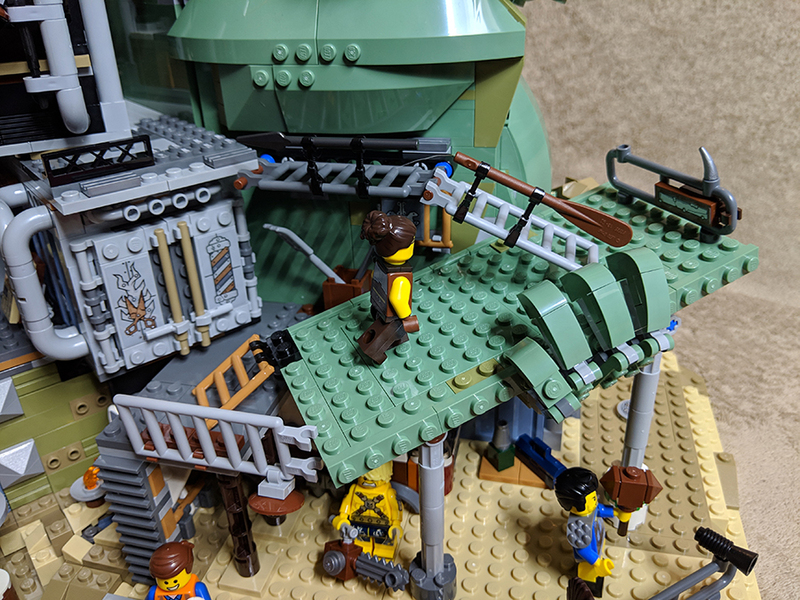 It’s a pretty impressive LEGO recreation of the characters unique look in the movie and fits perfectly into the wasteland world of Apocalypseburg. 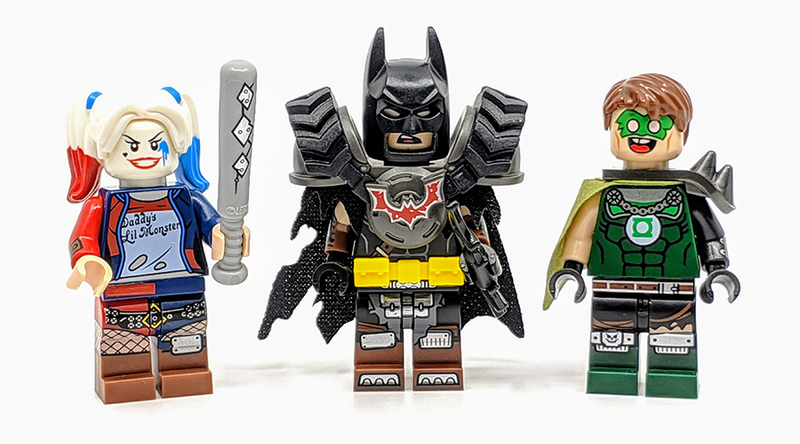 This is only the second LEGO Movie 2 set to feature Batman, who has gone all out with the apocalyptic makeover. He has somehow fashioned himself piece of special new Battle-ready shoulder armour, this is a combination element made from both standard plastic and rubber for the tires. This torso and leg print also reflects a time of war. Instead of just placing a tatty cape and tires on standard Batman, he now has a slightly modified and fashionably sleeveless outfit. It’s amazing that Green Lantern has only appeared in a single set in this variant of the character, so this technically this is the characters second appearance since 2015. The LEGO Movie version of Green Lantern is a little on the annoying side, well if your Superman. 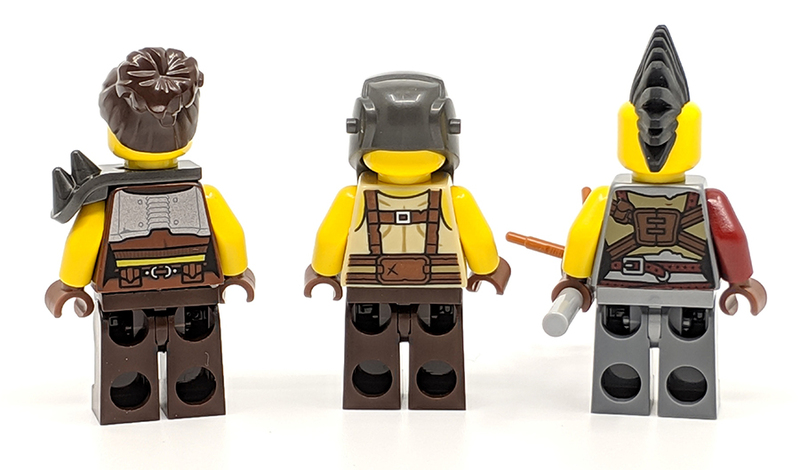 The minifigure is great and one of my favourite in the set. I love his battle-worn outfit and that amazing happy expression on his face. They may not be as important as those above but you need a few denizens to help fill out the cast and bring a little more life to the set. 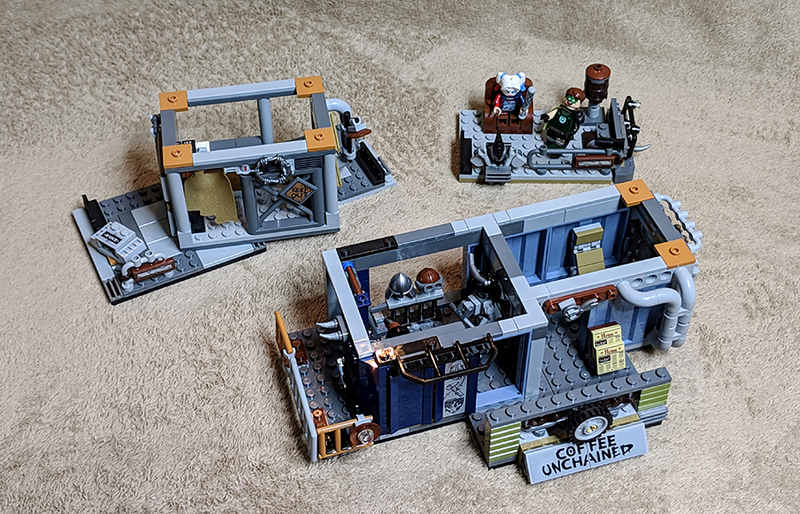 In fact they are lacking in many of the other sets based on The LEGO Movie 2. There are a trio of Apocalyoseburg citizens included Roxxi, Fuse and Mo-Hawk. 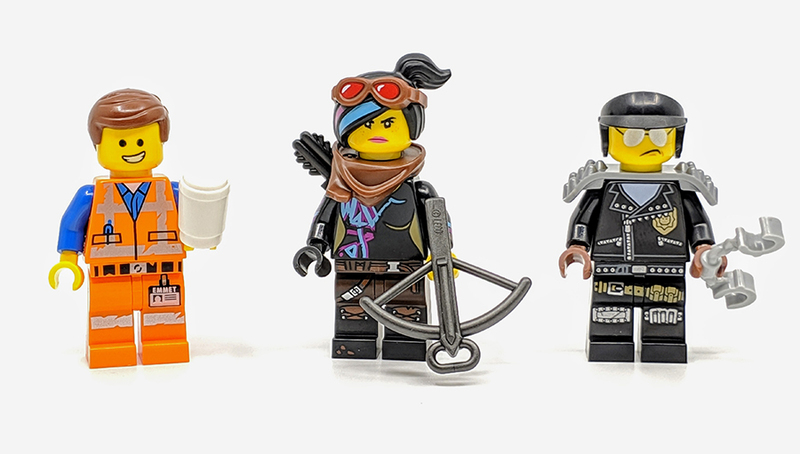 Although they are mere background characters, they are still great minifigures, particularly Roxxi, who has a Amazonian warrior look about her. Fuse sports a rare welder mask, complete with some flame print detail. 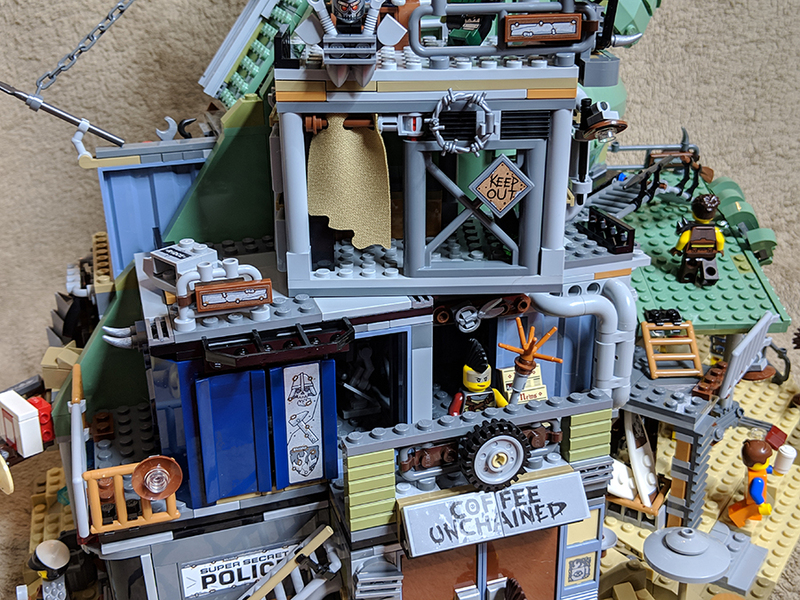 NINJAGO City set the standards for LEGO Movie D2C sets and that’s probably my favourite ever set and build. So this had a rather high bar to reach. 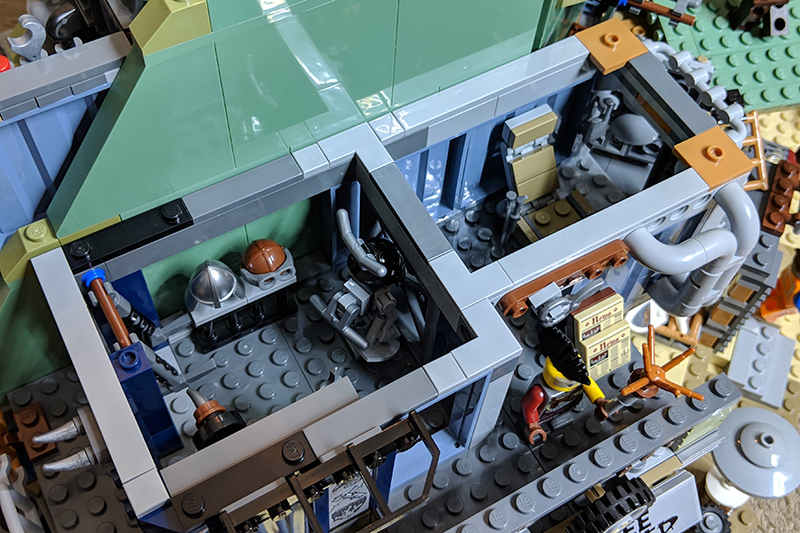 In fact all the large-scale LEGO sets based on the various movies from the Sea Cow to Joker’s Manor have been mighty impressive. But there is a new champ in town and words or indeed pictures really don’t convey how impressive this set is. 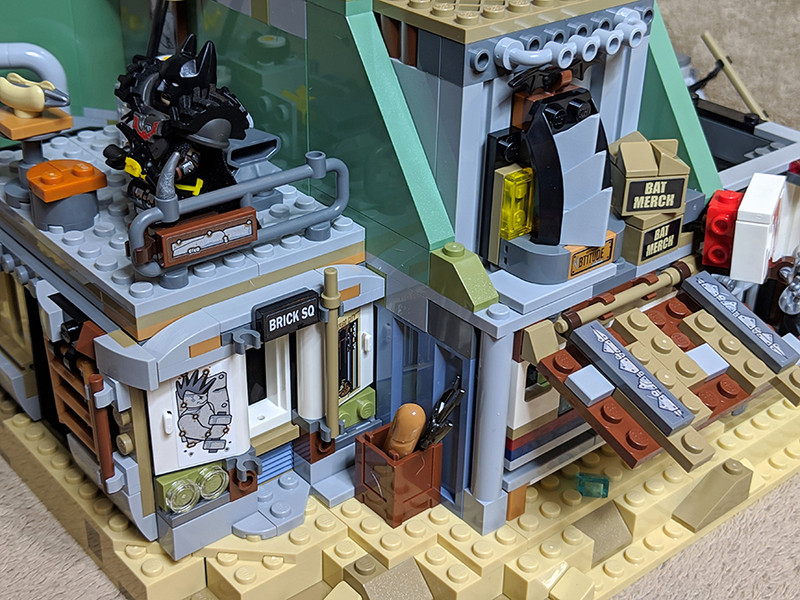 It’s designer, Justin and the rest of the LEGO Design Team have created a set which is great to build, ever better to look at and play with. 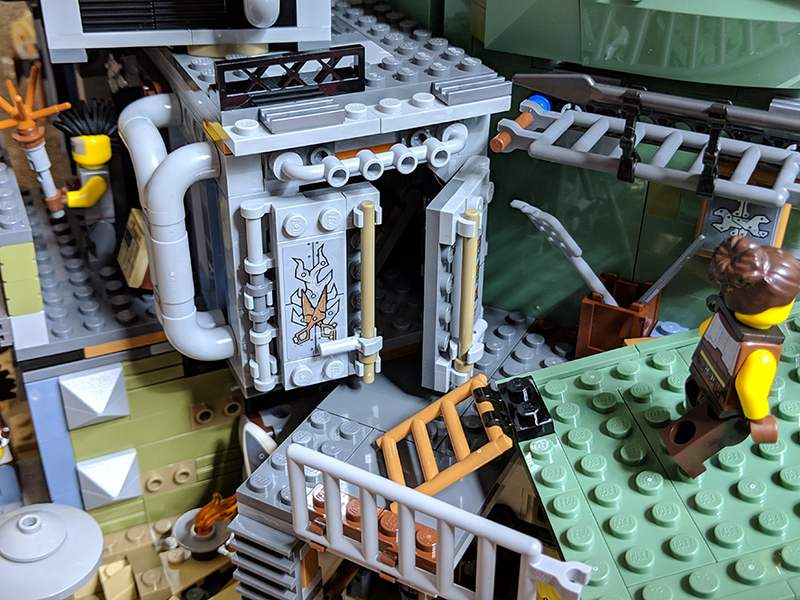 The use of parts and additional simple details dotted about like pipes, really adds an extra level flare to an already jam-packed visual treat. 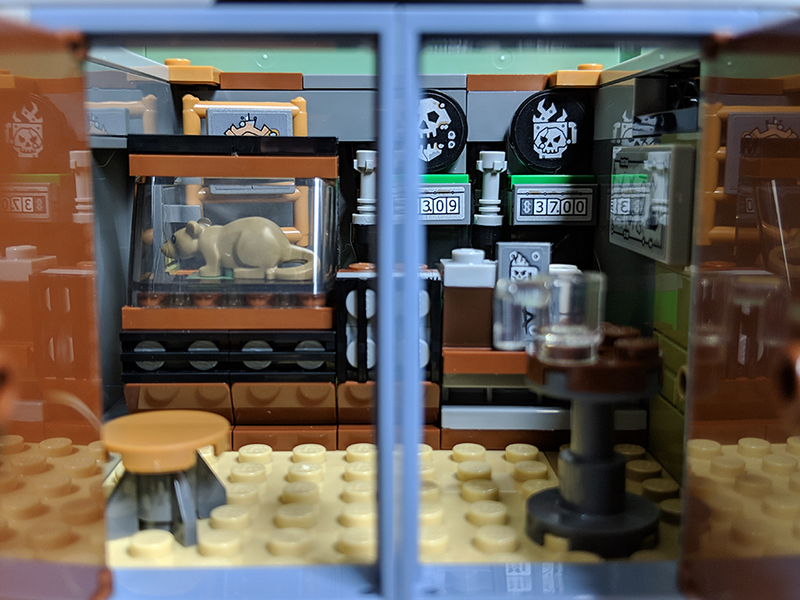 As soon as I saw the set I knew I wanted to build it and the experience of doing so was extremely satisfying. 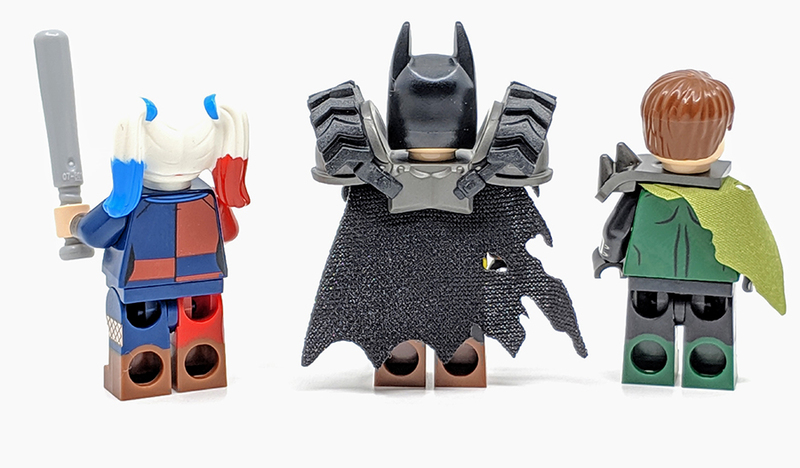 The selection of included minifigures are fun although I’d have like to have seen Superman join Green Lantern as they are so closely connected in the LEGO Movie universe. In essence this is as impressive set as it looks. 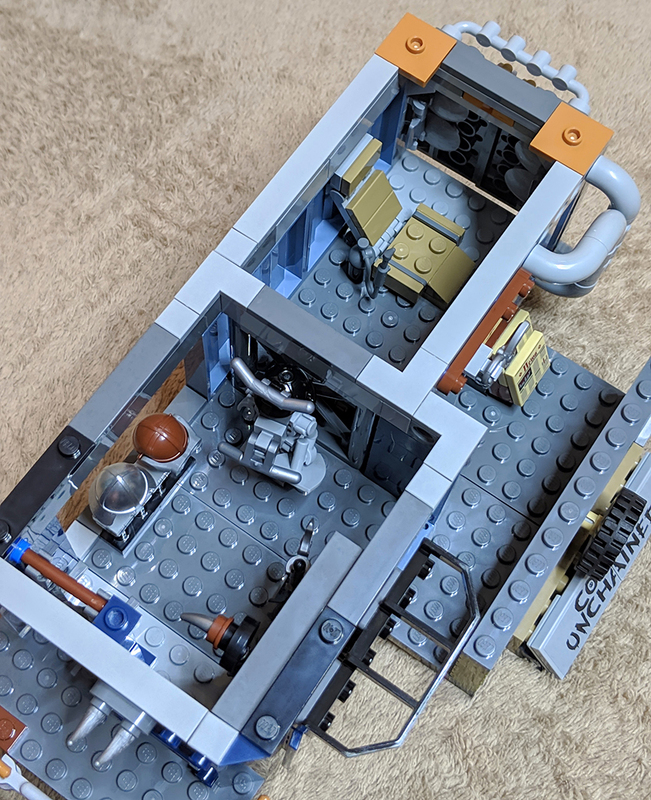 Before I bring the review to end, there needs to be a special mention for the sets instruction booklet, it begins with a little behind the scenes look at the creation of the set, along with a brief chat with some of those involved in its creation. 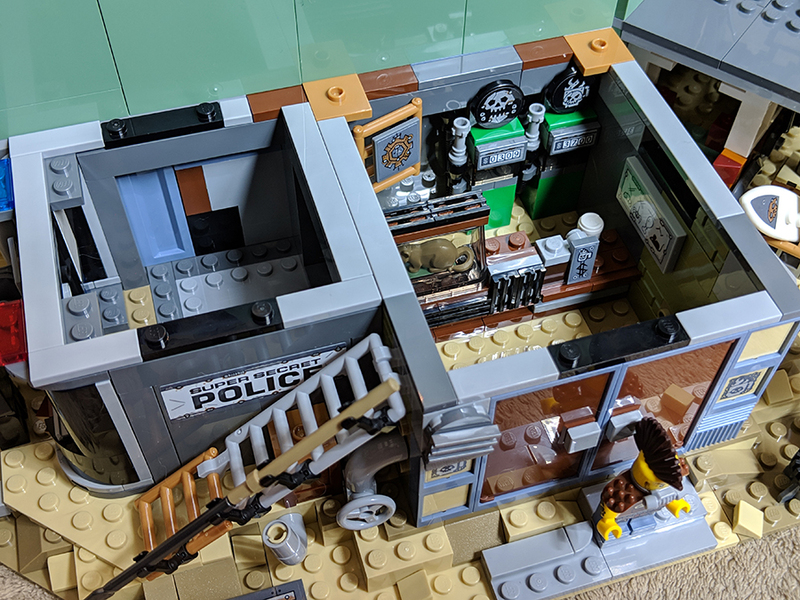 This set was provided by the LEGO Group for the purpose of review. 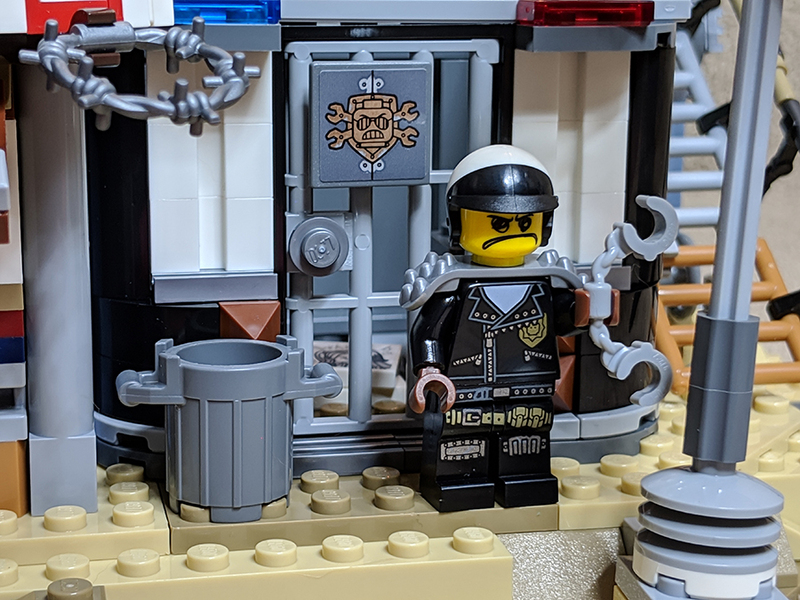 The opinions expressed in this review of that of BricksFanz and do not reflect those of the LEGO Group or Warner Media.